Though I've been exercising (walking first, then running later) for about 3 years, I've only done one marathon - the Mardi Gras Marathon in New Orleans last year. Up to that point, it represented the single biggest surprise of my life--I could actually run 26.2 miles. 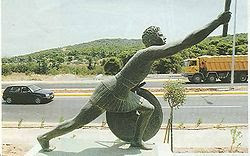 It all comes from the story of Pheidippides, the man who supposedly ran 26.2 miles from Marathon to Athens to announce the Greek victory over Persia in the Battle of Marathon. And, as the story goes, immediately after telling of victory, he promptly died. So I think at least some of the lore of the marathon is that fact that the guy who it's named after died. I think that makes us seem dangerous--dare devils, really. For me, the marathon represented the pinnacle of physical fitness. It was the top trophy, an indication that you had indeed made it as a runner. Many people run, but not everybody runs marathons. I put the marathon on a pedestal and revered the distance. I remember telling my parents when I started running that I would never run a marathon--ever, ever, ever. I didn't ever think that I could do it. That distance is ridiculous and there's no need for me to do it. And then, there was a need. 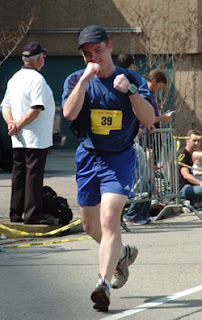 It crept up in me after my shoulder injury, and while still right arm in a sling, I signed up for the New Orleans Marathon in February 2008. What attracted me to it? It was there and I didn't know if I could do it. And I had to find out. It's funny. When you first start training, especially for your first marathon, you have this time out there in your head and you're convinced that you won't be happy unless you make that time. Otherwise, you'd be a failure. I thought that, too. I looked at my typical runs in the 8:00/8:15 per mile range and figured I could finish in 4 hours, maybe 4:15 if I had to slow down. So that was going to be my goal and I wasn't going to be happy if I didn't get it. Days before the marathon, I started to get really nervous. I knew I could do it, as I had done the training (or at least, my form of training). But I don't think I knew how to calm myself down before the race. That is, until I attended a first time runners meeting when I was down in New Orleans. The speaker, a doctor/runner from Florida who didn't look at all like a runner, talked about the pre-race jitters. Yeah, got it. And that you shouldn't try anything new on race day. Duh. But then he said something that really, really resonated with me. The marathon is your celebration for the training that you've done. You've worked hard and now it's time to celebrate. So enjoy the run. Look at the scenery. Talk to people. But, most of all, enjoy it, because this is your day to celebrate. I learned a lot about the marathon that weekend. Though I discussed it in my post-race report, there are a couple of points I want to mention because they would have made a huge difference. Don't forget to take gels, especially as it gets near the end of the race. I had an electrolyte imbalance after I finished and couldn't remember how to tie my shoes. While destination marathons are great, I really, really missed having family and friends there to cheer me on. I only got to see my dad twice during the race but I looked forward like crazing to seeing him each time. If I had friends and family there, that would be a big motivator. Eat a protein-heavy meal within an hour after finishing. I had almonds and a couple Clif Bars immediately at the finish line and I think that helped my recovery. While some races bar headphones (and technically the New Orleans Marathon did too), I should have worn them anyway. While it was nice to hear the sounds of the race, I really, really missed my music because I ran the entire race alone. Though there are a ton of training plans out there, I really didn't use one and I was fine. I just made sure to do a 12, 14, 16, 18 and 20 mile run in consecutive weekends that finished 2 weeks before the marathon. I'm just not that disciplined a runner to follow a plan, but a lot of people are. Will I run another one? Well, after the marathon, I had no inclination to run another one. Then, I decided that an ultramarathon was in the cards for me and I did that last October. And there's a marathon in September in Allentown, PA, which is where I lived for the last 7 years before moving up to New Hampshire. That means that I'd have access to friends and family (only an hour away from Allentown). And Bart Yasso, one of my personal heroes, is the race director. How cool is that? I'm still not sure but if I'd run another one, that marathon sounds like it'd be a good one. Interesting how differently people view marathons. Since I was a solitary runner for nearly 25 years before I signed up for a marathon, I thought that the challenge was to run every step of the way as fast as I could without any distractions and taking in anything but water. I had no idea that people had fun running marathons, consumed calories, talked or would want distractions from the task of running. None of those things were allowed in my black belt tests which were the only lengthy tests of endurance and mental strength I'd done to date. I remember using the same deep breathing and meditation/visualization drills that I'd used before for those tests while sitting in the corral waiting for the race to begin. Hope you do decide to do another marathon someday. My second one was Boston and a truly a very different from Disney (my first one). I used gels, talked to people a lot and felt like the race was just a 26.2 mile long street party. I met Bart Yasso there the second time I ran Boston and he is a really great guy. I'm sure his race will be a wonderful experience for you! Great posts with valuable insights. Thank you for sharing. I've told you before that I will never forget the advice you shared with me before my first, about the race being a reward and celebration of the training. It is interesting...I have no desire to do a local marathon because it runs along many of the same paths I run, day in and day out, while training all the time. I like the new scenery. I saw my dad twice at this last marathon though, and it was such a huge boost! This has probably been one of my favorite TIaRT topics. It's been really interesting to read everyone's journey. Great advice for any marathon, and good luck with your future races. It really is a very interesting take on it all. 5 marathons into it, I think the marathon keeps surprising me. I like destination marathons - I like having some friends along the way but I also love seeing / meeting new people and seeing a new town / area. What a way to bond with a place! I'll be very interested to see what you do next. It's kind of funny because I haven't really thought about going elsewhere for a marathon, because I live in a destination city. I'm already here! Best wishes with your running and training. I used to say I'd never run a marathon, and then I ran one. But I'm quite certain I'll NEVER run an ultramarathon!